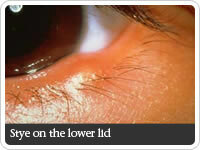 Dry eye is a disorder affecting the surface of the eye due to decreased quantity or poor quality of tears. The usual symptoms include a foreign body sensation and blurred vision. These symptoms should be addressed through a full eye exam to assure that no other more serious eye disease is present. Conjunctivitis is a group of disorders that have in common the symptom of a red eye. Other symptoms can include tearing, burning, itching, and discharge. The underlying cause can be an infection or allergy. However, many more serious eye diseases also cause a red eye, and only a full eye exam can help to make the correct diagnosis. Blepharitis is a common disorder affecting the eyelids and lashes. Causes include infection and inflammation leading to itching, burning, crusting of the lashes and red, irritated eyelids. A full eye exam should be done prior to treatment. Styes are red bumps usually found on the eyelid margin, near the lashes. Initially, they can be painful. Styes are caused by clogging and infection of eyelash follicles within the eyelid. A full eye exam can differentiate a stye from more serious eyelid diseases.